Cross Stitching Man - Cross Stitching - Not just for the ladies! Come on men! Now it’s your turn – have a read and get inspired! “At the beginning of 2018, I made myself a deal. In the magical glow of the new year, I told myself that I was going to do things I wanted to do without letting my expectations of what others would think of me cloud my decisions. This is how I started to cross-stitch. It’s something I’ve wanted to do for a long time, but like many men I know, I was too worried about what other people might think to actually do it. Ever since my first course in home economics in seventh grade, specific activities took on gendered labels. Girls sewed and boys built cars in shop. The implication was that needlework was girly and that for boys, girly was bad. I had always been afraid of crossing those boundaries. I started simply enough. My partner bought me a book of patterns titled Feminist Icon Cross-Stitch and walked me through the basic materials I needed. A trip to my local craft store later, I was ready to turn my open-weave Aida cloth, embroidery thread and cross-stitch hoop into a Michelle Obama piece. It took me about five hours just to get through the hair of that first piece. It didn’t come easily, but it never felt like work. The point of me doing this isn’t to become an expert cross-stitcher. It isn’t to make money selling my pieces. In all honesty, I’m not even very good at it at this point. But I don’t feel particularly bad about that. There has been something extremely freeing in watching a character develop on the cloth from my own fingers. It has helped me greatly with my anxiety. In moments when my brain is normally looking for things to criticize myself about, it has instead been focused on finding the right stitch for a Marie Curie piece. Or, it has been feeling proud as Ms. Marvel shows up on what was previously an empty piece of cloth. 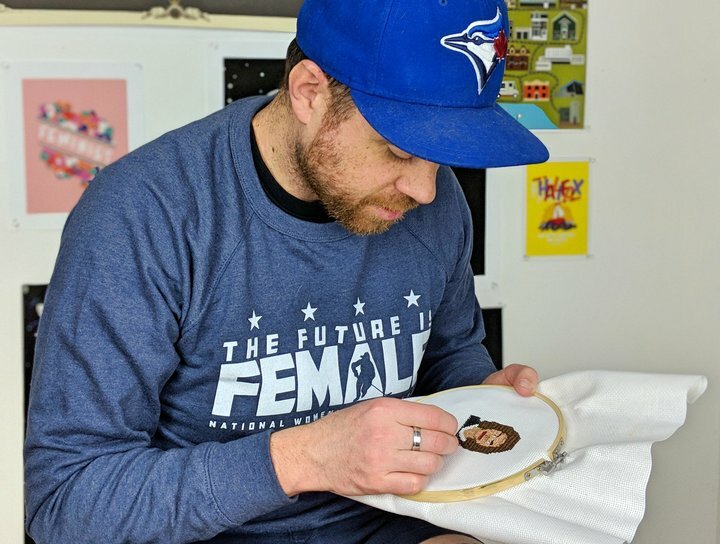 Cross-stitching feminist role models like Michelle Obama, Marie Curie, Wonder Woman and Ms. Marvel allows me to fill our office with pictures of strong women that our whole family looks up to. I think men miss out on great role models when they feel they have to limit themselves to the men in their lives. I like to show my daughters that many of the people I want to model my life after are women. What you find when you take the chance to do something you have always wanted to do is that you are not the only one. I am not the only man who is afraid to try something he might enjoy. Son at dance class? Bring your cross-stitch. Daughter at hockey practice? Bring your cross-stitch. Watching “Daredevil” on Netflix? Bring your cross-stitch. I don’t know if the terminology I use is correct, but I hope the enthusiasm I show for them exploring the craft is enough to make up for that. As many of us know, there is a certain fragility to masculinity that means we sometimes don’t feel we have permission to do something until we have seen one of our own doing that thing, too. We are strange; we are wrong to think like this. But, if other men need to see someone enjoying himself cross-stitching three different versions of Luna Lovegood, I want to be the one to show them. In the conversations I have had ― and there have been multiple ones with men interested in taking this up ― some of them have commented about how they never thought they would be able to do it but now, hey, maybe they can. Since I’ve started cross-stitching, I’ve had people I have never met approach me and ask what I am working on. Within the first two interactions, I realized that none of the fears I had of being sneered at or laughed at had any merit. People overall are quite interested in what I am doing and in fact seem to love seeing a man cross-stitching in public. Imagine getting to a place where men don’t evaluate an activity based on how much strength it requires but on how much happiness it brings to one’s mind instead? To understand that being victorious, either physically or intellectually, isn’t what makes a person a role model. Imagine if we better understood that what has come to be known as feminine can bring us immense joy. That femininity isn’t inferior. And it’s something men should enjoy. Not only are other men watching me enjoy my hobby, my two daughters are. It is immensely satisfying to sit down with a cross-stitch piece and have my daughters wander over and tell me how good it is. As strange as it sounds, it is also great to hear them tell me how badly I botched Michelle Obama’s eyebrow. Both of my daughters have now taken up cross-stitching because of the pieces I have created. 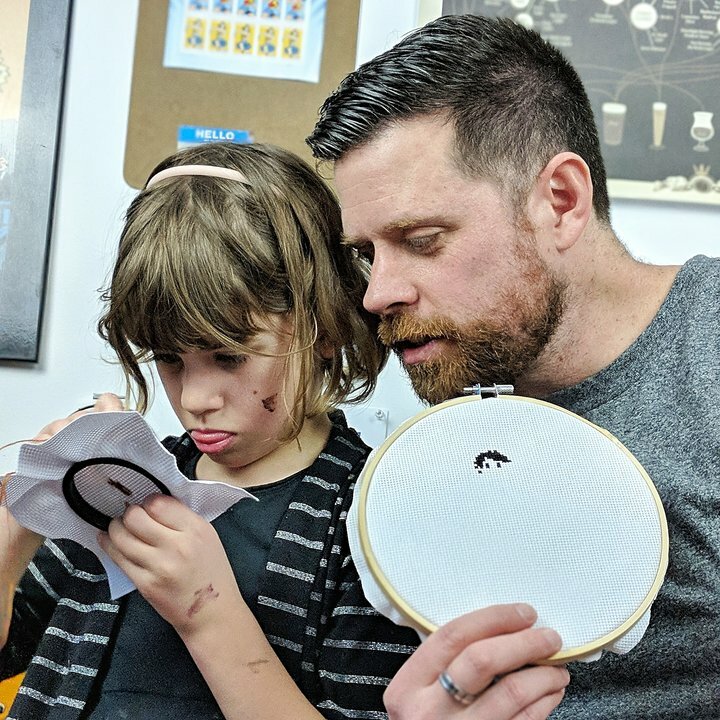 It is satisfying to realize that to them, cross-stitching isn’t a gendered activity. They don’t see it as something men do or something women do. Gender roles and expectations are important things to talk to our kids about, but they are even more important for us to show. And what they see is their dad smiling (and occasionally swearing) as he works on something that makes him happy.